Now that we are in the heart of a transition season (aka: fall), extreme weather becomes much more frequent. The heat of summer, while fading, tries to hang on as long as it can while being constantly bullied by Arctic air masses. In the warm air masses lie the epilogues of summer. It gets hot, but not that hot, and certainly not as humid as we would see in summer’s dog days. However, it is that much easier to see stretches of above average temperatures as averages begin their slide into the winter lows. The same can be said for those under the influence of fresh, cold air from Canada-on-north. Temperatures are more likely to dip below freezing as the sun angle becomes more acute and we see calmer, clearer nights under big Arctic highs. 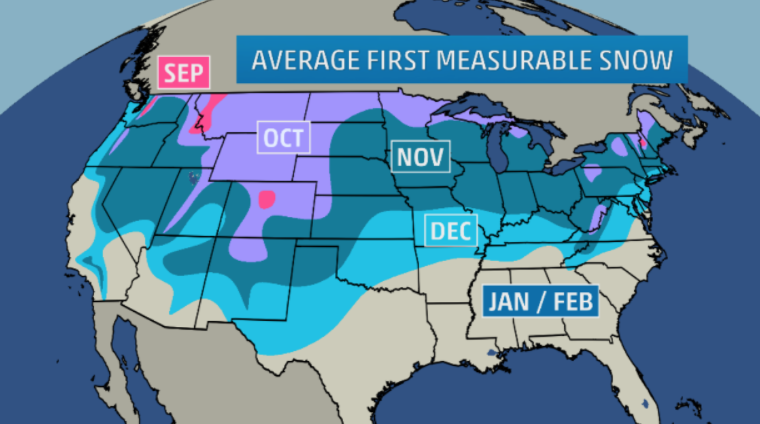 Over half of the US will see its first freeze of the season during the month of October. And of course, cold air sets the stage for snowfall, big snowfall at that, as snow levels drop in both elevation and latitude. Anywhere from New England through the upper-Midwest and into the heart of the Rockies is fair game for measurable snowfall. In between the hot and the cold, the road is paved for severe storms as we enter the second season for hail and tornadoes. And finally, although the tropical season is fading fast, we still have to watch for in-close development as quick spin up lows can burden the Gulf and Atlantic coastlines. So, was this October a trick or a treat from Mother Nature? Let’s find out! 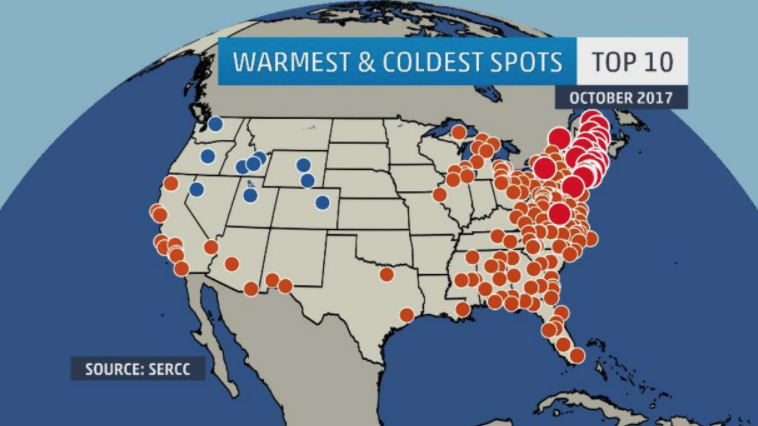 We start in New England where the epicenter of heat was located during the month of October. 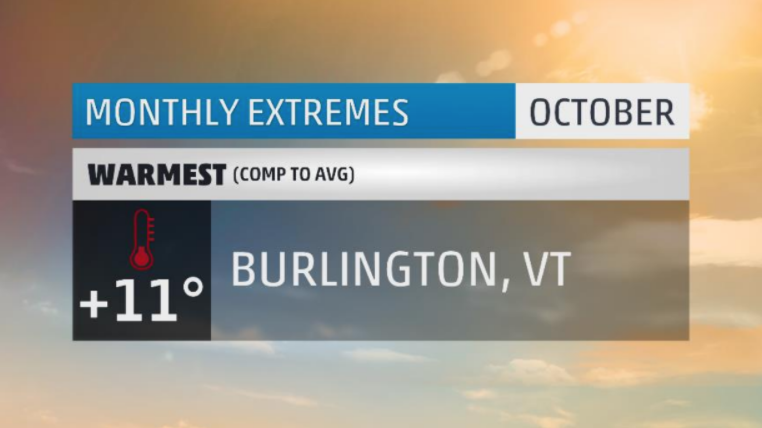 The warmest such location was Burlington, Vermont at nearly eleven degrees above the monthly average. Burlingtoners witnessed the city’s warmest October on record, with records going all the way back to 1884. Twenty-eight of the month’s thirty-one days were above average with eighteen of them being at least ten degrees above average. On October 8th, Burlington hit 80 degrees, something that has only been done 24 times since 1884 – or roughly 18% of all Octobers. Their typical average last 80-degree day occurs on September 17th. Only once during the month did they fall to-or-below 32 degrees. That is tied for the 2nd fewest 32 degrees days in any October in 133 years. On average, Burlington sees 8 or so morning lows below freezing in October. While average high temperatures in Burlington fall from the low 60s down to 50 by month’s end, this October Burlington had 27 days at-or-above 60 degrees. That was the most number of 60-degree days in any October on record. On the flip side, Burlington had 15 low temperatures above 50 degrees. That was also the most of any October on record. Note that the typical low temperature in Burlington during the month of October is near 40 degrees. Amongst all the heat, 4 daily temperature records were set during the month: two high temperature records and two warm low temperature records. Out of the some 800 or so official National Weather Service weather observation stations scattered across the US, 84% of them ended up with above average temperatures for the month of October. The pattern this year has been much of the same. 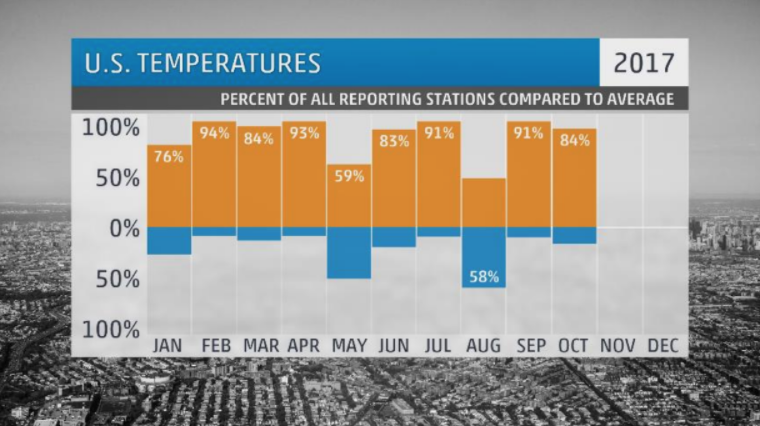 With the exception of August, every single month of the year has featured a higher percentage of stations with above average monthly temperatures than below. One notable month, so far, has been February, where 94% of all stations finished the month above average. It is safe to say that 2017 has been runaway warm and will likely end up as one of our warmest years on record. The coldest spot in the US is located an hour and a half northeast of Reno, Nevada along Interstate 80. The city of Lovelock clocked in at nearly six degrees below average for the month of October. That was cold enough to be the 4th coldest on record. October featured 23 days below average with ten of those being at least ten degrees below average. Twenty-five mornings had lows at-or-below freezing which is tied for the most for any October on record. Temperatures were topsy-turvy during the month with highs reaching 80 and lows falling into the teens. Also of note was the lack of precipitation during the month. 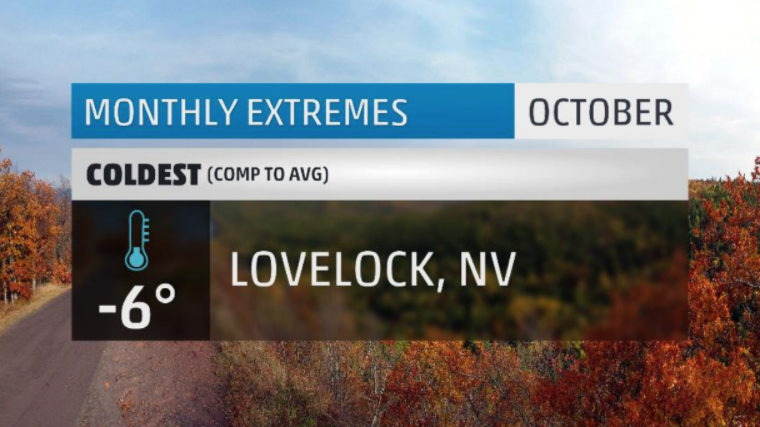 Lovelock tied the record for driest October with no measurable rainfall. The culprit for the warm afternoons, cold nights, and dry weather was persistent high pressure over the area throughout the entire month. This is the same high pressure system that can kick up the Santa Ana and Diablo winds that plague parts of California with dry, hot, breezy weather that fueled numerous wildfires. For Lovelock, no records were set during the month. The only section of the US to see cooler-than-average weather was locked into the Northwest and intermountain west. Heat was widespread from the tip of Maine to the tip of Florida. Close to twenty cities would experience their warmest October on record, including: Bangor, New York, Albany, and Hartford. A total of 212 cities would crack the top ten in terms of warmest Octobers on record. Two incredibly heavy rain making events would propel this coastal Alabama town to our wettest city of October. Just a short, half-hour trip north from Gulf Shores is the town of Robertsdale, Alabama. Here, folks of the small town had their wettest October and 13th wettest month on record. The first wave of incredibly heavy rain would come as a result of land-falling Hurricane Nate. Nate, a fast-moving and quick-hitting hurricane made landfall near Biloxi on October 8th. In nearby Robertsdale, nearly six inches of rain would fall in a two-day span. Later that month, a strong, autumn cold front would be accompanied by training severe thunderstorms which produced flash flooding across the Gulf Coast region. Nearly seven inches of rain would fall in just one day during this event. The close to 17 inches of rainfall they saw during the month was a whopping twelve and a half inches above average. 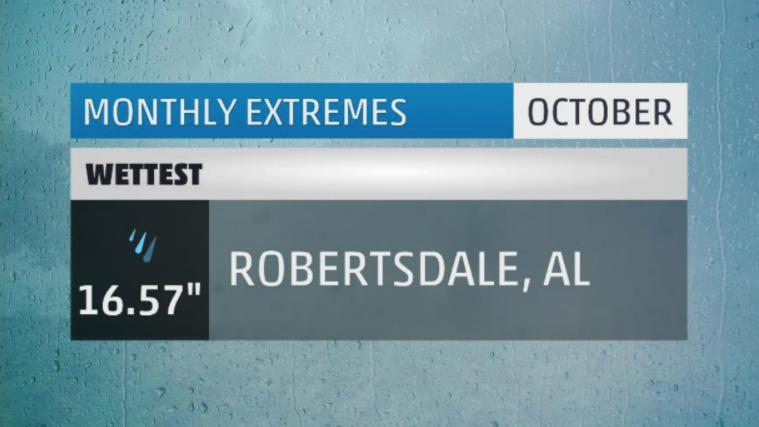 In addition to the monthly rainfall records, Robertsdale would set three daily rainfall records during the month. Through October 31st, this is their wettest year to date on record. Nate left quite an imprint from the Gulf coast along the Appalachian chain leaving a deluge of rain behind. Along with an active storm track through the Great Lakes, just over 200 cities would have their wettest October on record. Of note: Lansing, Grand Rapids, and Mobile would have their wettest October. The Santa Ana and Diablo winds, and overall dry weather pattern, continued to plague California where there was an overall lack of rainfall during the month. 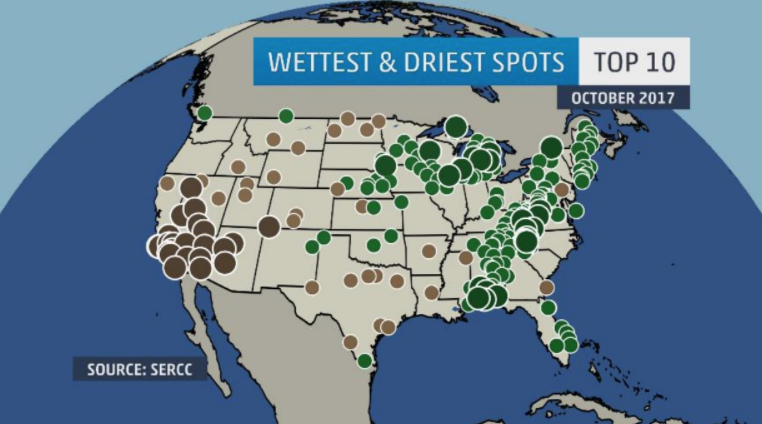 Los Angeles, Phoenix, San Diego, and Las Vegas all had their driest October on record. 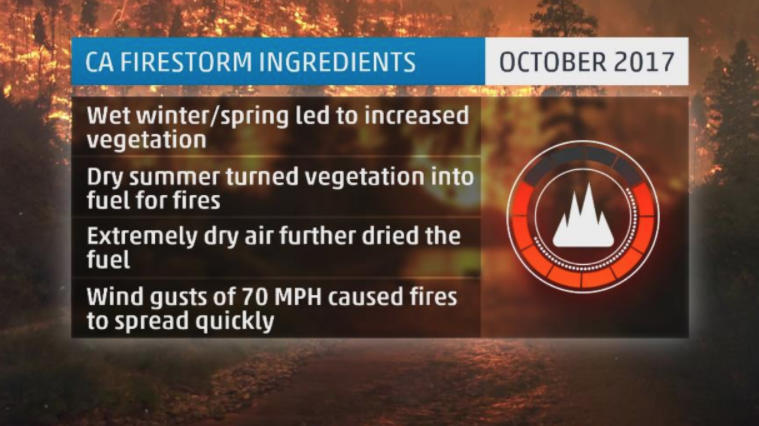 The dry weather was one of the key ingredients that set the stage for an alarming wildfire outbreak in Central and Southern California. The worst of California’s wildfires would come in October as both Central and Northern California would see explosive fire growth in a very short amount of time. The hard hit areas were in-and-around the Napa Valley. Unfortunately, these fires would result in the greatest loss of life during a wildfire event since 1918. Nearly a quarter of a million acres were consumed along with close to ten thousand homes and businesses. California’s largest and most destructive wildfires to date would be among the fires in this outbreak. Getting us pretty darn close to the Canadian border is the town of Havre, Montana (pronounced like Have-er, if you were wondering). This town in Northern Montana was the snowiest city in the US this October at 13 inches of the white stuff. 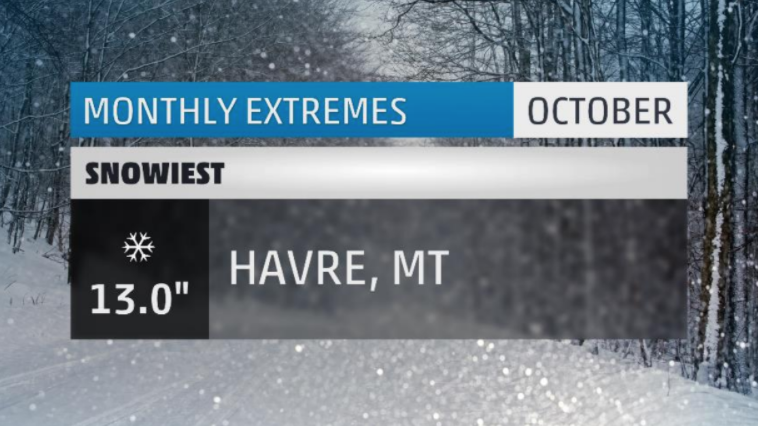 This would make for Havre’s 2nd snowiest October on record as well as their snowiest single day and two-days in any October. The average first inch of snow can be expected around November 6th, so we are a bit ahead of schedule. Technically, this would be the 6th earliest first inch or more of snow on record going back to 1944. It is, however, their earliest such date for at least 9 inches of snow, so there’s that. Just one day before the flakes started to fly, the high temperature climbed to a balmy 57 degrees. And to show just how topsy-turvy October temperatures can be, the night following their snowfall, the low temperature dipped to a frigid 6 degrees. That’s 30 degrees below their average low for that date. It was also their coldest October temperature in nearly a decade. Within a week of the snowfall, temperatures rebounded to the 50s and 60s. The two days of snow would be their only snowfall for the month. In all, one daily snowfall record was set. Many locations from New England through the Rockies see their first measurable snowfall during the month of October. This includes places like Denver, Cheyenne, Marquette, Duluth, Burlington, and Caribou. By next month, nearly two-thirds of locations that typically see snow in any given winter are fair game for snowfall. Forty-six cities would see measurable snowfall this October; that’s roughly 6% of all US weather reporting observation sites. 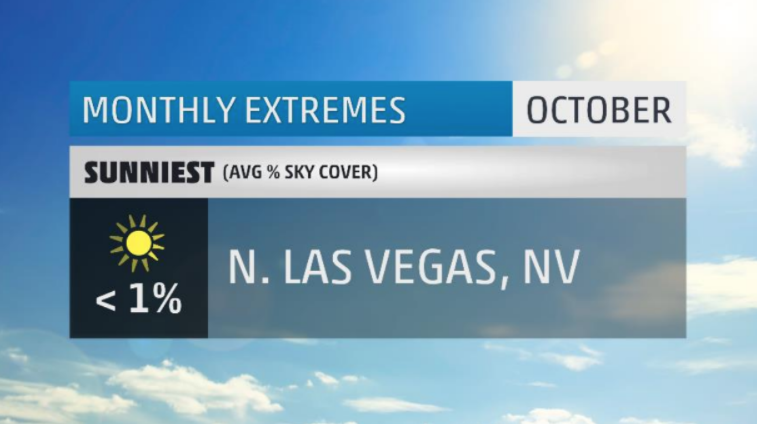 It took us a while, but Monthly Extremes has finally made it to Vegas! This October, Las Vegas (or at least the weather reporting station in the northern section of town), was the sunniest spot in all the US. With 31 days of full sunshine and not a drop of rain, Vegas definitely lived up to its moniker of the 4th sunniest location on the planet. Las Vegas sees about 294 days of sunshine per year, which equates to about 3800 hours to soak up some rays of sunshine. This October, all the warm sunny days led to their 6th warmest October on record at about two degrees above average. With 16 cloudy days to just one sunny day, Detroit topped the list as the cloudiest spot in the US in October. Those 16 cloudy days were accompanied by 17 days with measurable rainfall. Eighteen days of the month featured thick fog which probably made things seem cloudier than they already were. 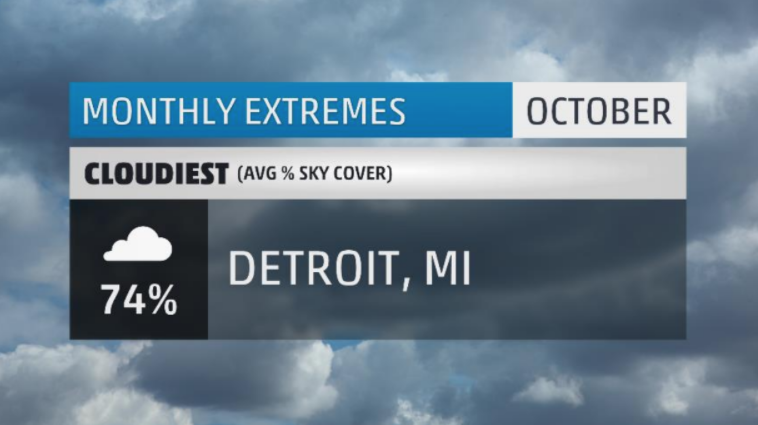 Detroit is actually the 9th cloudiest city, on average, in the US. They also see about 160 days with thick fog per year. With close proximity to Lake Michigan, fog easily forms as colder air sits near and on top of the warm lake. Detroit’s fog season begins in late September and lasts through the early winter months. There you have it, the extremes for the month that was October 2017. Make sure to check back next month to see what November has in store. 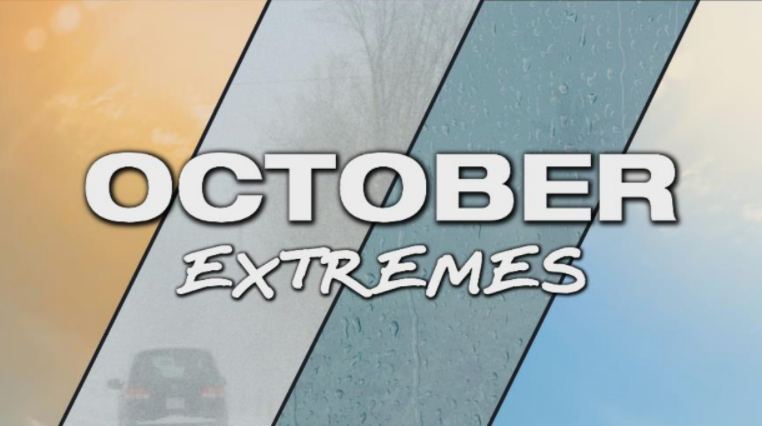 What extreme weather did you face in October? Let me know in the comments below. I’m in Camden, Maine, and observed 18 highs 65+ in October . . . almost double the previous 17-year record. At 7.2 degrees above normal, it was my 3rd warmest month (December 2015 and January 2006 were about 8 above normal). October’s coldest daily high was 55, and it was the month’s only day with a high cooler than 58 (the previous 17 Octobers all had a coolmax in the 40s or even upper 30s). What about severe thunderstorms, ice, or even wind? Me and my horse love cold weather, but we are michiganders, cold weather and cloudy is the norm. Where’s the “real” extreme weather? It seems we are on track for a routine winter. We are in Northern Wisconsin and on the southeast edge of the Lake Superior snow belt. Snowfall began on the 9th of November and seems to be similar to prior years. Two or three years ago we had 13 inches at this time. So far, so good. Let’s get out the snowshoes and cross-country skis!